5-Way Chop with Chris MacNeil Crowned Champion! 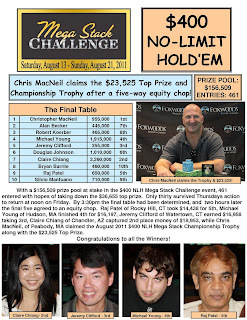 The final five players in the $400 Mega Stack Challenge have come to an agreement on an equity chop. Chris MacNeil is officially the champion of the event and takes home the trophy and $23,525. The board came [9c][7c][7d][Jc][2h] and Young paired his jack on the turn to win the pot and eliminated Johnson in 6th place for $6,652. The board ran out [Qd][4c][4d][8d][Qh] and Clifford's pocket tens held to win the pot. Alan Becker was eliminated in 7th place for $5,400. The board ran out [5h][4c][3h][Js][Ad] and Chiang spiked an ace on the river to win the pot and send Koerber to the rail in 8th place for $4,304. The board came [9d][8d][5c][Td][Ts] and MacNeil improved to trips to win the pot and eliminated Mantuano in 9th place for $3,536. After being cripple just one hand earlier, Brian Barrile moved all-in for his last 100,000 with the blinds at 20,000-40,000 with a 5,000 ante. He was called by both Silvio Mantuano in the small blind as well as Chris MacNeil in the big blind. Both players had two pair with a king kicker and Barrile tossed his cards to the muck. Brian Barrile takes home 10th place for $2,269. $400 Mega Stack Final Table Streaming Live! You can now watch the final table of the $400 Mega Stack Challenge by clicking "Watch LIVE Video" at the top of the page. We are down to the final two tables of the $400 Mega Stack Challenge. The blinds have just been increased to 10,000-20,000 with a 3,000 ante. With 20 players remaining, the average chip stack is now 461,000. You can click "Watch LIVE Video" at the top of the page to view the live stream of all of the action. Day 2 of the $400 Mega Stack Underway! 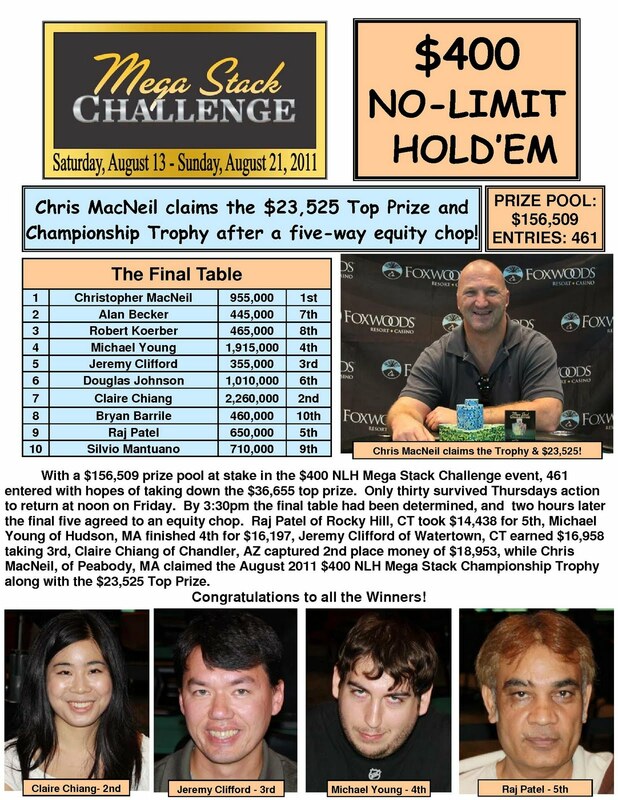 Day 2 of the $400 Mega Stack Challenge NLHE event is back underway. There are currently 30 players remaining and the average chip stack is just over 307,000. The blinds are starting at 6,000-12,000 with a 2,000 ante. There are 30 players remaining and the average chip stack is now just over 307,000. Play will resume at noon tomorrow with the blinds at 6,000-12,000 and a 2,000 ante. Full chip counts and seat assignments for Day 2 will be posted as soon as they are available right here on FoxwoodsPoker.com.